At this time of year, we recount the miracles and wonders of Israel’s military victories, and liberation of our holy sites. My 10 year old son, Ariel, reminded me that today is “Yom Shichrur Le’Chevron” – Hebron Liberation Day. Ariel also mentioned the miracle of Rabbi Shlomo Goren in Hebron on 8th June 1967. 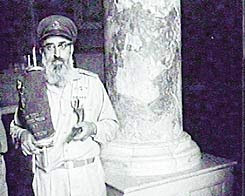 Ariel quoted Parshat BeChokotai: “Five of you shall give chase to a hundred, and a hundred of you shall give chase to ten thousand; your enemies shall fall before you by the sword.” Ariel pointed out that Rav Goren even exceeded the promise of this blessing – as one Jew had defeated a whole city of 80,000 Arabs. Rabbi Goren was present with Israeli forces as the IDF conquered the Western Wall in Jerusalem. Holding the rank of general, Rabbi Goren knew that the army's next mission was Hebron. Wanting to be among the first Israeli's in the ancient City of the Patriarchs, he joined the armed forces stationed at the recently captured Etzion Block, on their way to Hebron. On the night of 28 Iyyar, before retiring for the evening, he requested to be awoken when the soldiers began their march to Hebron the following day. The next morning he awoke, only to find himself alone with his driver. Realizing that he had been "left behind," he ordered his driver to begin the 20 minute journey to Hebron, expecting to meet the rest of the army, already on their way. Rabbi Goren thought it peculiar that he hadn’t encountered any other Israeli soldiers on the road as he reached Hebron. He thought to himself surely the Israelis had already finished the job of marching on Hebron already. Driving into Hebron, Rabbi Goren was greeted by the sight of white sheets, hung from roof-tops and windows, throughout the city. He was astounded, but understood. In the summer of 1929, Arab residents of Hebron had massacred 67 Jews and wounded many others. The 1967 Arabs of Hebron were, very plainly, scared of Jewish retaliation. So, they did not fire one shot. Instead they hung white sheets from windows and roof-tops. Rabbi Goren quickly made his way to the Cave of Machpela. Finding the huge doors bolted, he tried breaking in by shooting at the lock, firing his Uzi submachine gun. Finally, after getting into Ma’arat HaMachpela he blew the Shofar, as he had done 24 hours earlier at the Western Wall. Only afterwards did Rabbi Goren discover that when he left the base at the Etzion Block, the rest of the forces were on the other side of the hill, making plans for the attack on Hebron. They did not know that the Arabs would surrender. In other words, Rabbi Goren, a single Israeli soldier, single-handedly conquered a city of 80,000 Arabs. Jews had returned to Hebron and to Ma’arat HaMachpela! Rabbi Goren hung an Israeli flag outside the Ma'ara and brought a Sefer Torah inside. The next day he received a telegram from Minister of Defense Moshe Dayan. It read, "Take down the flag, take out the Sefer Torah, and everyone who enters must take off his shoes, because the building is a Mosque!" Rabbi Goren sent back a telegram saying, "The Sefer Torah is Kodesh (holy) - it stays. The flag means to me what it means to you. If you want to remove it, do so. I will not touch it." Please thank Ariel for bringing it to our attention! Wow - I can't say I knew this! Mazaltov! My nephew, Gedaliah Kestenbaum married Devori Soloveitchik in Jerusalem last week. Gedaliah has married into rabbinical aristocracy. Devori is the daughter of Rabbi Yitzchak Zev Soloveitchik, and the grand-daughter of Rabbi Meshulam Dovid (Reb Dovid) Soloveitchik, who is Rosh Yeshiva of Yeshivat Brisk (one of the two) in Jerusalem. 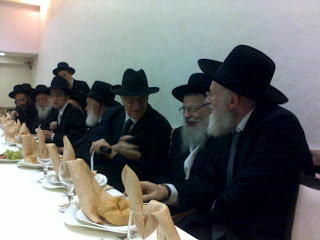 The Soloveitchik's are a rabbinical dynasty descended from Rabbi Yosef Dov (HaLevi) Soloveitchik (The "Beis Halevi") and his son Rabbi Chaim Soloveitchik ("Reb Chaim Brisker"). Rav Chaim's sons Rabbi Yitzchak Zev (Reb Velvel) Soloveitchik ("The GRIZ" The Brisker Rov) and Rabbi Moshe Soloveitchik seem to have gone in different hashkafik directions. Whereas Reb Velvel's descendents are predominantly right wing hareidim, Rav Moshe's branch are leaders in the Modern Orthodox/National Religious hashkafa – most notably Rav Joseph Ber Soloveitchik ("The Rav") and Rav Aaron Soloveichik. Oy Vey - Trouble Ahoy! Dirty Dough in the Bread Market? Is Temple Mount In Our Hands? Should Rav Motti Elon Teach On-Line?